Today continues the April A-Z Challenge. This month, I'll be blogging (almost) daily about a different speculative fiction trope, one for each letter of the alphabet. Today's entry is on fictional Gods. Throughout history, theism (and religion in general) has been one of the most potent driving forces of human culture. Deities and the worship thereof have been at the center of some of the most important and beautiful contributions mankind has offered this world--and some of the most terrible. Considering the grand scope of theistic worship and the passion and conflict it inspires, it's no surprise that many writers incorporate gods and religious figures into their stories. While many stories contain references to real-world religion, this entry will deal with those created by writers as part of the worldbuilding process. Most speculative tales with heavy theistic elements fall under the fantasy genre, though not always. How far an author is willing to take the god angle varies from story to story. In some cases, an author may choose to create deities that become living, breathing characters, perhaps interacting with the protagonist or lending him aid. Some writers make this heavenly intervention transparent and obvious to the reader, others less so. Often, we see god-like or demonic antagonists that the hero must overcome, perhaps with no assistance from the heavens. Many writers also take a more "realistic" approach, inventing deities that exist only in the mythology of the world. Defining an important character's religious beliefs can add entirely new facets to them, often changing the way the reader (or viewer) interprets their actions and motivations. As a child, John Milius' Conan the Barbarian introduced me to Robert E. Howard's seminal works in the sword and sorcery genre. To me, Conan was the epitome of awesome. I absorbed every Hyborean text I could get my hands on. 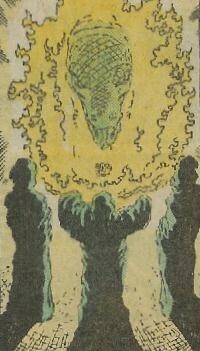 One of the most intriguing aspects of Conan's badassery is his occasional invocation of the grim Cimmerian god Crom. In a world full of strange people who worship strange deities, Conan chooses to acknowledge one who's known for watching complacently from a mountaintop, intervening only to bring trouble and doom to those who lack valor and courage. Most of my own fantasy stories take place in a shared world, which I call the Forged Realm. I've only explored this world in a few short stories, but an overarching theme has been the power struggle between the three main religions that its denizens adhere to. The name of the world itself refers to its oldest creation myth, which says that an immortal dragon deity forged the world by breathing through clenched teeth. Creating these myths and religions has been one of the most enjoyable parts of building the Forged Realm, and helped make it a place that I want to come back to again and again. Hopefully it will have readers one day who feel the same. In the meantime, I'm making an effort to explore different aspects of religion in my stories. The story I'm working on now has some of the most difficult concepts I've ever had to translate from my weird subconscious, all relating to a certain culture's religion. It's giving me fits, but I'm doing my best to drag it out of my noggin and onto the page to see where it takes me. After all, yielding to frustration would not please Crom. If someone asks you if you are a god, you say yes! Good Stuff... to the challenge "G" is for Genuine! That scene was almost in this entry instead of the Game of Thrones one! Nothing in Earth's history has polarized people so much, has brought about so many wars and has shaped social values as much as the worship of deities. This is valid for any age in humanity's evolution up to this point, and I highly doubt it will ever change in the future. It's foolish to assume that fictional worlds (whole worlds, such as are created in fantasy and sci-fi) would not be affected by worship of one shape or another. So "hell yes!" to the importance of GODS in fiction! Great post J.W.! The Forged Realm sounds awesome! I'm living in "parallel universes" too, this one, where I have a day job and chores and a blog and cool new friends (*wink*), and my fictional universe, with its people, laws, different worlds and species, belief systems and societal rules, and so on. So I fully understand your fascination with creating and exploring whole worlds, with societies and religions and myths of their own. Tell us more about your fictional world! I'm really curious. Thanks so much, Vero! I wholeheartedly agree on the importance of religion in fictitious worlds, even in scifi. It's just plain more realistic. You better have set your story way in the future if you expect me to believe in a religion-free world. I'm glad you liked the little tidbits of the Forged Realm I mentioned! It's been one of my favorite worlds to write in lately. I think when the A to Z Challenge is over, I might give a wider glimpse here on the blog. I'm waiting to hear back on a couple of stories under consideration in some cool markets too, so cross your fingers for me and maybe you'll be able to satisfy your curiosity with a published story! So much of everything boils down to religion. Too often it's conflict. I agree, Jaye. Hopefully we'll get past that one day, but it's a pretty optimistic thought. Religion plays a key roll and shapes the world, especially in fantasy. It's often the very basis of the storyline of good versus evil. And Jeremy's comment above gave me a chuckle! Absolutely! If people are willing to die for their faith in the real world, why remove that element of natural drama and conflict in a fantasy world? LOVE the Song of Ice and Fire series. Martin is incredible. And Ghostbusters...one of the best movies of all time. Great post and happy A-Z blogging. I'm with you, S.L.! Martin has me on the edge of my seat waiting for the next book. Hopefully, it's not as long a wait this time around! Thanks! Same to you, Martha! As usual, thanks for the well thought out informative piece, the recommendations and the good read! Thanks, Randi! I'm with you on that. I've always loved reading on up mythology and religion, too. The research can easily become a time vortex because it's so fun. Your story definitely sounds like it will be interesting if it incorporates several kinds of mythology. Can't wait to read it one day!